Is lumber drying your responsibility? Then you should know what HILDEBRAND can do for you. 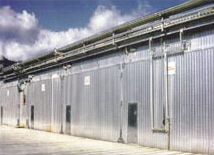 We will meet your needs with the very best lumber dry kilns and control systems. Our products offer more and more safety and quality. They are environmentally friendly and deliver maximum performance. Our drive for improvement combined with decades of experience is obvious in our conventional lumber dry kilns. All our kilns include: Highly insulated aluminum or stainless steel construction, reversible heating and ventilation technology, maximum drying quality and drying performance, environmentally friendly and energy efficiency. 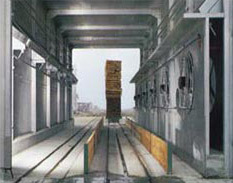 Most commonly used kilns in the lumber industry is the model HTR100. These kilns are available with stacking width of up to 56 feet and with track lengths of up to 100 feet. The most popular door design is the sliding lifting door. Other door designs are available as shown under the section on Door designs. This kiln is designed for loading packages of 2 x 1,5m width and 2 x 1,5m height in various required lengths. Specially competitive due to volume production and low operating costs. Available for both package and track loading. Also here additional attached kiln chambers can easily be added later. and MODULAR KILN KITS - installation parts. According to the operational requirements our kilns are available both as forklift loaded package kilns and kiln cart loaded track kilns. Our specialists will find together with you the best economical solution for your requirement. Flexibility distinguishes the solutions of HILDEBRAND. This becomes clear with the available selections of the door designs for our kilns. Here everything is shown under Door designs. All the same for which kiln model you decide, the right choice of the computer control equipment gives you maximized drying results, economic efficiency, safe drying process and optimal operating sequence. Please review the information provided on this Internet page to Computer Control Systems from HILDEBRAND-BRUNNER. Available are, for example, also Climate zones as supplied with the HIGH VAC®. 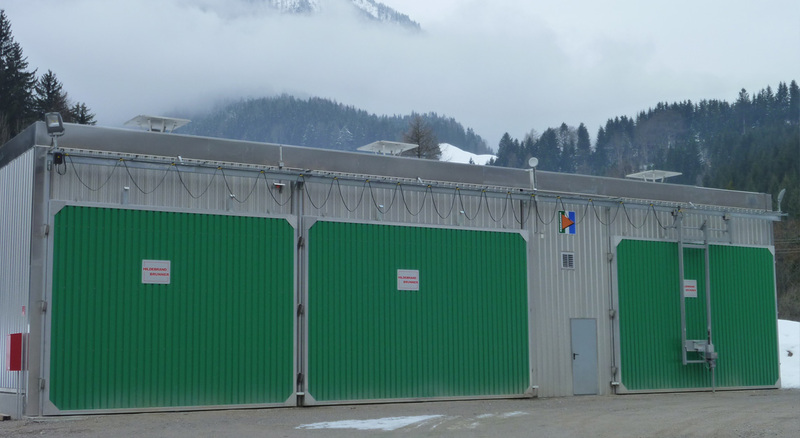 You find detailed information on the scope of supply and variations of the conventional lumber dry kilns from HILDEBRAND-BRUNNER under the following links or you can download our brochures.